Dr. Giulianotti soon will be able to make his vision a reality with a 3-D, flat-paneled display system that provides so much resolution it achieves a human’s 20/20 vision quality. 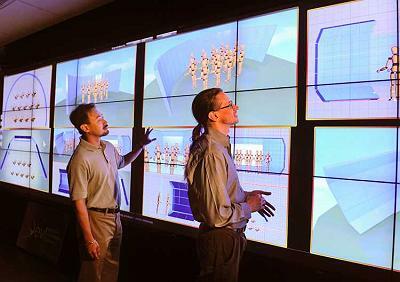 The display walls can be moved so that they can be used not only for the operating room, but for any number of top-priority needs that require super-high-functioning imagery and computer networking speed. This new technology is known as the Next Generation CAVE (NG-CAVE), featuring high-tech upgrades to UIC’s CAVE Automatic Virtual Environment, introduced in 1992, where 3-D images are projected onto three walls and the floor. Researchers aim to have a prototype by next summer and expect a fully functioning Next Generation Cave by the summer of 2012, with help from federal stimulus dollars. Here’s how CAVE will be advanced in the Next Generation: The original CAVE used projectors to rear-project images on screens in specially built rooms. Users wore expensive 3-D glasses. The Next Generation version takes advantage of thin LCD panels, 3-D film overlays, lightweight 3-D glasses, computers many magnitudes faster than the original, and very high speed networks that let users access and share high-resolution images while collaborating remotely with one another. The Next Generation CAVE also is less expensive to maintain than the existing version. The project is funded through a $702,500 Obama administration stimulus grant from the National Science Foundation and $300,000 from UIC. The money enables the continuation of funding for 10 full-time employees and the work of 15 graduate students. The Next Generation CAVE provides students such as Dennis Chau the chance to keep his job working in the ultra-realistic virtual reality lab while learning the skills for the high-tech work force of tomorrow. If history repeats itself, industry (from medical facilities needing to view high-resolution patient images, to manufacturing companies doing rapid prototyping) will want to install versions of the NG-CAVE and will need to employ researchers, production workers and distributors. Chau, aiming to get his Ph.D., said his experience working at EVL has helped him become more mature because each person is responsible for showing up to work and fulfilling his responsibilities, rather than having a parental figure give him step-by-step directions. Chau is excited that the Next Generation CAVE can help businesses gain productivity and enable people to experience breakthroughs that would have been impossible without it. The NG-CAVE might even enable manufacturers to make better-quality 3-D TV sets, give astronomers a new look at the heavens and enable high-definition, life-size video of one’s friends to jump to life on the wall when you want to talk with them. Andy Johnson, an associate professor of computer science at UIC, said the NG-CAVE will enable teams of designers, scientists and doctors from across the world to work together in advanced-visualization environments as though they were in the same location so they can solve problems and make discoveries. The NG-CAVE also will take advantage of StarLight, the Chicago-based international networking communications exchange, to move information much faster than over the Internet.